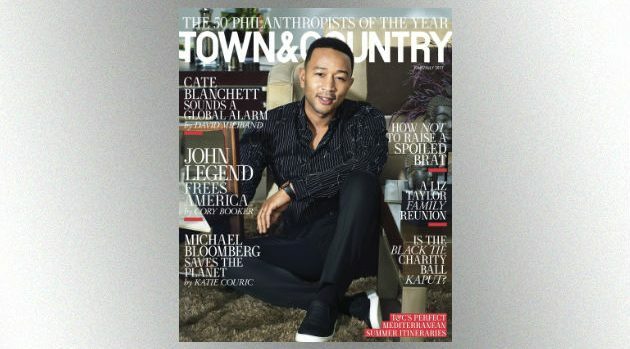 Max VadukulJohn Legend has been named one of Town & Country’s top 50 philanthropists of the year. The singer, who graces one of the magazine’s three covers, is being recognized for his work to reform the criminal justice system and end mass incarceration. Legend says he was inspired to take up the issue after accepting the Oscar for “Glory,” his song in the Dr. Martin Luther King Jr.-inspired film, Selma. “I specifically chose to talk about our mass incarceration problem, because if you want to talk about what is going on with America today that Dr. King would be concerned about, I think mass incarceration would be right near the top,” Legend says. John is behind the nonprofit campaign #FreeAmerica and is launching a fund called Unlocked Futures, which provides grants for formerly incarcerated people to launch businesses. He’ll be speaking at the fourth annual Town & Country Philanthropy Summit today.